Apple has squeezed a 5K display into the same confines of its current iMac and has managed to do so without blowing out the price. Not everyone will need the rich resolution of a 5120x2880 display. Running the computer at its native resolution shrinks texts and icons to levels that are uncomfortable to view. Microsoft’s Word and Excel have no business here. 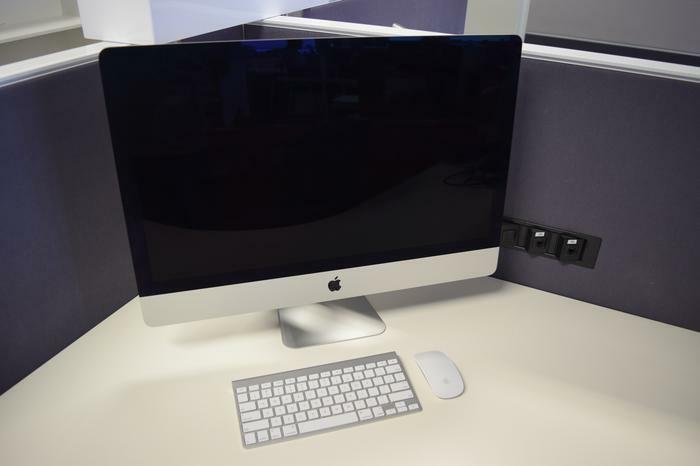 The 5K iMac is best suited to creative professionals, such as graphic designers and photographers. The array of 14.7 million pixels has the dexterity needed to juggle multiple high-resolution photos, or to showcase the tiny fallacies in projects other displays would let slip through the gaps. Cramming more pixels than an ultra high definition (UHD) television into a smaller screen means content, whether it’s photos or videos, benefits from a mesmerising level of attention to detail. Content is sharp and colours transition from one to the next with the utmost subtlety. The Good Gear Guide office offers anything but ideal lighting with our test iMac nesting in front of a window and below fluorescent lights. Despite these challenging conditions, the iMac’s screen remains comfortably lit at two-thirds of max brightness. In a few words: Apple hasn’t sacrificed brightness in its pursuit of efficiency. 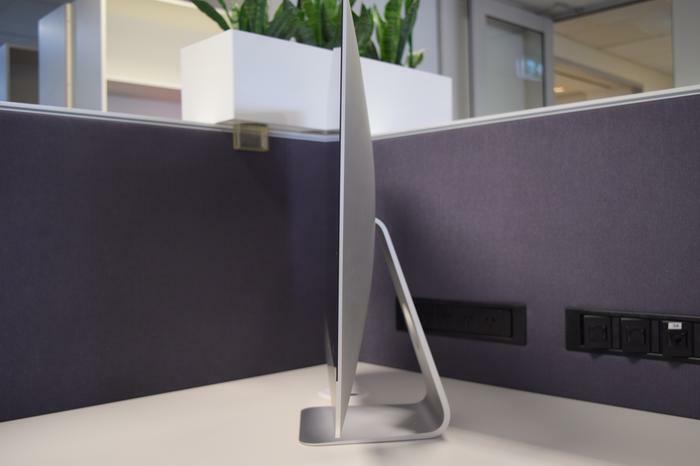 Apple has focussed on maintaining existing brightness levels while lowering the iMac’s energy footprint. Company executives claim the 5K variant is 30 per cent more efficient. Combating pesky reflections is a compensation film introduced to the range, which also retains screen quality at more angles. 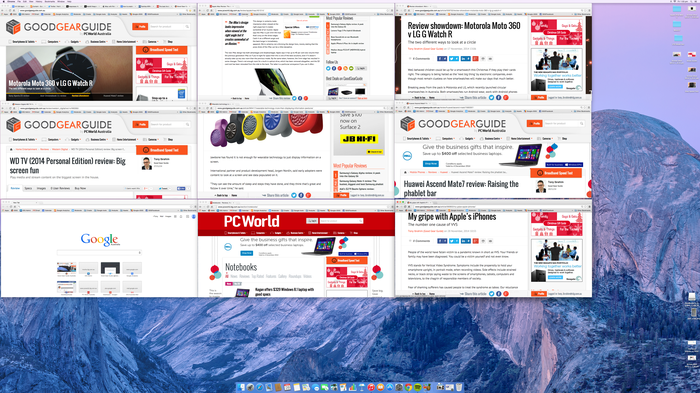 A screen shot at the iMac's native 5K resolution. The resolution is hidden away in the menu and requires users to press the option key when they select the 'scale' setting, which is found under System preferences> display. Remove the screen from the equation and the revised iMac largely resembles its predecessors. The aluminium body is rounded around the back and tapers at the edging to a respectful 5mm. Thick black bezel continues to line the borders. Apple’s logo, featured up front and prominently on the back, shares the same shade of black. No buttons or ports deface the facade. 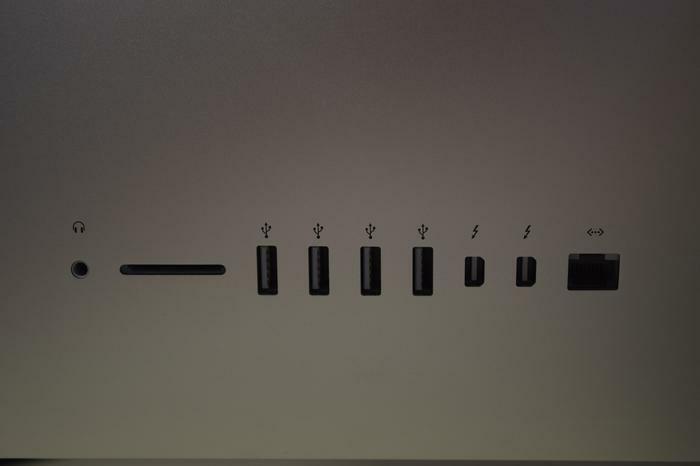 You’ll need to blindly finger the bottom right of the iMac for the power button, and the entire computer will have to be swivelled round in most cases to access the connections on its bottom left. Doing so requires little effort to be exerted — all it takes is two fingers — as the design of the iMac somehow discounts its 9.5kg weight. Having to swivel the all-in-one around each time you want to insert an SD card or plug headphones in becomes a chore. Audiophiles will find the ordeal more irksome because the headphone jack is on the wrong side, and this causes the headphone cable to cross over the keyboard. 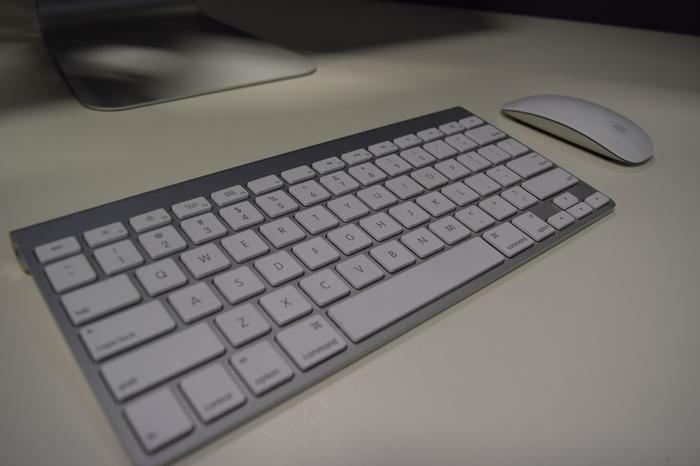 Working in the iMac’s favour is the quality of its keyboard and mouse. These wireless peripherals feel like an extension of the iMac rather than independent components. We found them as comfortable to use as they are aesthetic. Most will be happy from the sound quality of the iMac. The volume reaches levels ideal for YouTube videos and the occasional music track. People serious about music will want a stereo setup to go along with the 5K screen as the iMac’s speakers lack control at the top-end. Two variants of the 5K iMac are offered by Apple. The top of the range model is priced from $3599. That gets you a 4GHz quad-core Intel core i7 CPU and an AMD Radeon R9 M295X graphics card with 4GB of GDDR5 memory. Our review unit introduces the range at $2999, with a 3.5GHz quad-core Intel core i5 CPU and an AMD Radeon R9 M290X graphics processor that has 2GB of GDDR5 memory. Both versions ship with 8GB of 1600MHz DDR3 RAM, though the iMac can be shipped with 16GB or 32GB of RAM. A 1TB 'Fusion' drive is included as stock. Regular files are stored on a 128GB SSD drive for access to them quickly, while a 1TB hard disk drive acts as a reserve for the files used less often. More demanding users can configure the iMac to come with drives as big as 3TB. The iMac returned promising results during testing. We transcoded a .mp4 video recorded with a mirrorless camera 129.6MB in size, to a web optimised .mp4 47.8MB in size. The iMac performed this task in 1 minute and 9 seconds, while a standard core i7 notebook took 2 minutes and 38 seconds. Rendering an image using Blender 3D took 13 seconds, while a disk speed test, using BlackMagic, scored a commendable 299MB/s during a write test, and an astounding 656.7MB/s for reading. During testing the iMac showed no signs of strain. It runs quietly and, unless you place your hand over the vent up back, at low temperatures. The Yosemite 10.10 operating system runs seamlessly, transitioning between tasks under the guise of animations, and benefiting in functionality from both the App store and its belonging to a replete ecosystem. The high price of resolution rich displays makes a 5K iMac a no-brainer of a purchase for creative professionals. It is the best all-in-one on the market and it’s the best at a competitive price.